The Switch is by far the hottest video game console on the planet right now, and that’s not going to change for the foreseeable future. Having the ability to play the same great games on the big screen and on the go is just awesome. Then there’s the SNES Classic Edition console, which is definitely still our favorite retro mini console. Wouldn’t it be cool if there was one device that combined them both? Now there is. 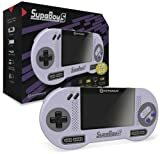 It’s called the Hyperkin SupaBoy S Portable Pocket Console for SNES, and it’s only $93 on Amazon. You can play it as a handheld console or connect it to a TV, and it plays every single SNES cartridge ever made!